Tea Forte ranks high on my list of attractive packaging and tasty tea for gift giving. This season is no exception. 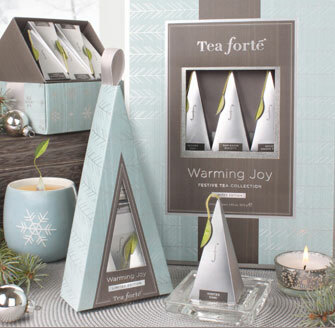 Their line of “Warming Joy” (packaged in sleek ice blue & grey with a snow flake motif) includes creative options starting at $6. Choose from the mini pyramid set, the collectors tin or ribbon boxes. My favorite is the tea chest: 40 pyramids housed in a tiered, flip top box. The chest features 20 varieties of black and herbal tea (two pyramids of each) with blends like Rum Raisin Biscotti and Winter Chai. These teas are not for the connoisseur, but they’re fun and fancy for a holiday treat. Perfect for bringing out with dessert … let guests pick their own bud. NOTE: Sale prices going on now!